Listen to any Wikipedia article on your Mac, iPod, or iPhone. Is there a better alternative to Speakapedia? Is Speakapedia really the best app in Audio category? Will Speakapedia work good on macOS 10.13.4? Speakapedia... 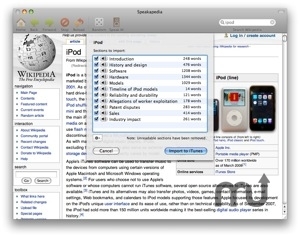 Listen to any Wikipedia article on your Mac, iPod or iPhone. Get the background on the place you're visiting, research a topic on the way to class or find the facts behind the news. Then manage everything seamlessly within iTunes. Choose your article using the familiar wikipedia interface. Speak it! Speakapedia will convert your article to speech. Listen to your article in iTunes or on your iPod or iPhone. Fixed bug relating to compatibility with QuickTime/iTunes 10. Fixed font size issue in main browser window. Speakapedia needs a rating. Be the first to rate this app and get the discussion started!